Before 54 years old, VENNY NYOTOWIJOYO had lived a peaceful and happy life. In her best years, a man fell in love with her in the first sight. Three years later, they got married. They had a cozy and sweet life and her husband had never forgotten her birthday. They had two children, a boy and a girl, and her children were obedient. When her children grew up, her children got further education at abroad. She was satisfied with life. However, there was a turning point in May 2011. VENNY NYOTOWIJOYO found out there were 2.5cm lumps on both sides of breast. After inspections, she was diagnosed with breast cancer. She was very worried about breast cancer, which she thought was lethal, and her mother died for breast cancer. Her husband consoled her that God gave them a test. VENNY NYOTOWIJOYO was extremely afraid of taking surgery because her mother died for metastasis of cancer cells after surgery so she chose conservative treatment. She also received another cancer treatment, too. In May 2013, VENNY NYOTOWIJOYO’s breast turned to another condition: the lump on her right side of breast was gone but the other on the left side enlarged to 10x10cm which looked like a dark purple hemisphere. There was also an enlarged lymph node (2x3cm) on her left axillary. In order to alleviate the pain, she brought more than ten leeches to draw the blood of tumor. Though it was disgusting, she felt relaxed after doing this. Finally, she decided to take surgery. Due to safety problem, she chose to take cancer therapy at abroad. At this time, her best friend were about to take return check in Modern Cancer Hospital Guangzhou so her friend invited her to go there. VENNY NYOTOWIJOYO believed that it was God that guided her to Modern Cancer Hospital Guangzhou. On May 6th 2015, she took a check about CEA which was 1129.14ng/ml and CA153 was 53.1U/ml. The multidisciplinary team (MDT) advised her to undergo surgery and after surgery, she needed to take interventional therapy to kill cancer cells thoroughly. A few days later, surgical expert underwent an excision of left breast cancer. After surgery, doctor diagnosed her with left breast infiltrating ductal caner Ⅲ B period which meant she was in middle stage. In the surgery, the cancer and invaded tissue were cleaned. Then she began to receive interventional therapy. In order to combine slight intravenous chemotherapy, she began to lose her hair and at last she lost all her hair. Her husband understood that his wife loved beauty so he brought five wigs. These five wigs had companied her for almost half year. Until December 2013, cancer treatment was completed and she already grew dense hair and did not need wig any more. Now, three years passed and VENNY NYOTOWIJOYO grew beautiful hair. At the end of May 2015, she took a return check with her husband. The result showed that the condition was good and there was no sign of recurrence. She moved on from breast cancer and had a new life. Two grandsons were born and she became grandmother. VENNY NYOTOWIJOYO cherished her life and she kept eating blank and healthy diet and kept running. Every Saturday, she will have dinner, enjoy chatting or see a movie with her friends. VENNY NYOTOWIJOYO believed that God protected her and helped her defeat cancer so she hoped to share her anticancer experience and build up other patients’ confidence to fight against cancer. She always participated in many symposiums of cancer and bravely showed her incomplete breast and scar. She also humorously told people how to put the sponge into the underwear so that it looked real. 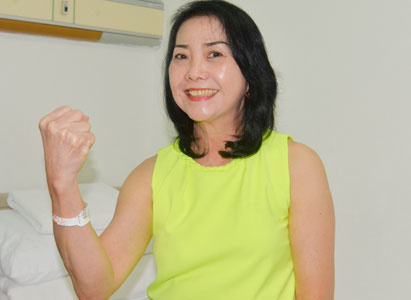 In April 2015, VENNY NYOTOWIJOYO was awarded as “Anticancer Star” in ASEAN Academic Committee of Minimally Invasive Therapy because she kept an optimistic attitude towards fighting against cancer and positively helped others.